Condo Close to Peak 9 Quicksilver Lift & Town with Panoramic Mountain Views! The 1,400 sq. ft. condo is a 2 + bedroom (plus sleep loft), 3 bathrooms, and with a panoramic view of ski slopes and mountain range from the 3rd floor balcony deck and the living room windows. It is conveniently located within a few minutes walk to the Peak 9 Quicksilver lift at the base of the mountain and to Main Street. You will not need a car to get around and enjoy Breck! This clean, spacious condo can accommodate a large group or family (6 - 10 people). The loft can sleep up to 4 people as a 3rd semi-private bedroom. The condo has a fully equipped kitchen, and a dining area with large table. The living room with cathedral ceiling has comfortable furnishings to accommodate a large group, and 49' flat screen HDTV with DVD/CD stereo with iPOD & MP3 hook-ups. An open gas fireplace makes the room cozy. Each room has its own thermostatically controlled heat for your individual comfort. Each bedroom has comfortable furnishings and a full bathroom with vanity area, and HDTV/VCR/DVD, as well as access to a rear balcony. The wrap-around balcony deck off the living room has table & chairs and a gas grill for entertaining or just lounging in the western sun while enjoying the mountain views. Wireless Internet (WiFi) availability in the condo. Individual Parking garage is directly below the condo. Laundry room and Ski Locker are located on ground floor. Living Room - 2 large sofas + 2 lounge chairs and studio chair, 49' flat screen HDTV, DVD, CD stereo with MP3/iPOD cable. Kitchen & Dining Area - Fully equipped and a dining table seats 6. The clubhouse has 4 hot tubs, and a heated swimming pool, and locker room. My wife and I own this condo and we rent it out to Breckenridge visitors, as well as enjoy it ourselves. We enjoy the mountain life. We chose The Lift Condos because of the close proximity to the Peak 9 chairlift and walking distance to Main Street, and the beautiful views of the ski slopes and mountain range. Very relaxing! 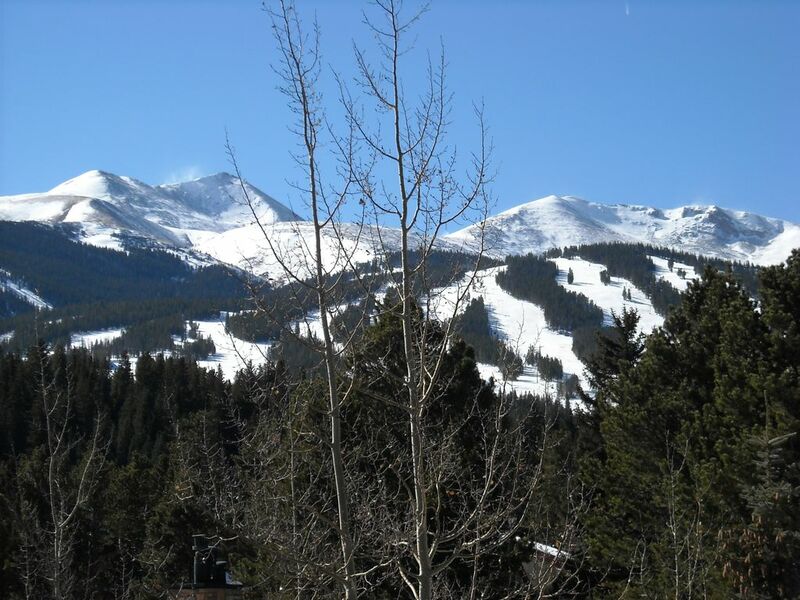 Breckenridge is a worldwide destination resort with many amenities and always things to do year-round. The view of the mountain range is one of the best views in Breckenridge. Being close to the mountain and town is a major advantage, and yet it is quiet and peaceful at the condominium complex. We enjoy using the year-round heated swimming pool and choose from any one of the 4 indoor/outdoor hot tubs. Toilet, Tub with shower, sink in vanity area outside bathroom. Plenty of towels, hair dryer, hand soap. Bath towels, hand towels, & face towels are furnished. We once again had a great time staying here! It was the second year in a row for our ski group to stay in the condo, and we hope to return again. Our group of five had plenty of room to spread out with room to spare. We loved the location - it was easy to walk to the Peak 9 base and tons of places in town, but also far enough away from Main Street. The owner was very responsive and very easy to work with. We loved our stay and would definitely stay here again. We were a family of 7 total and had plenty of room. The best feature of the condo is the location near the base of Peak 9 as well as the very short walk to restaurants/shops. We never got in the car the entire stay. The condo itself is cozy and has beautiful mountain views. The owners are very nice and easy to work with! This condo is situated perfectly for walking to the lifts or downtown. It was large enough for us all to have our own space and the three baths were perfect. We definitely hope to return soon. The only difficulty is the stairs up to the top floor...worth the view but could be difficult for anyone with stair issues. The owners were prompt and helpful. Thanks! I am very late leaving my review which I feel bad about since the owners were so prompt, courteous and accommodating of our group needs when we stayed in Feb. of 2014. The owners are definitely some of the best VRBO owners i have worked with and we have used VRBO a lot. It was such a good experience, we just booked the condo again for another week in 2015. The owner is very responsive and professional, everything is as advertised, no surprises and the condo itself is great. It is very well located being near both the lifts and retail establishments. The condo is not huge but can comfortably accommodate a large group and the rates are very reasonable compared to other condos. The 3 bathrooms and multiple bed configuration are perfect for a larger group. Midweek cleaning is provided from what I recall. The condo complex does a good job with snow removal on the streets. The climb to the 3rd floor is very tiresome after days of skiing but the views from this corner unit are great. It is probably considered the best located unit in the building. Definitely recommend you staying here, great condo, great location and awesome owners who make the whole process very easy.